Have you ever looked around your glorious outdoor space and pondered, just exactly, what flowers and petals can be safely and satisfyingly consumed? Edible flowers and petals are very on-trend, particularly with the rise in Instagram users and the constant quest for pictures of perfection. Everyone is suddenly a pundit and photographer with a strong desire to showcase the best pictures to their followers. Beautiful cakes adorned with scrumptious soft buttercream icing are now being covered in flowers, buds and petals; chosen perhaps for their beauty and not always for their taste. It is very important to pay close attention to exactly what garden flowers you consume. Please be mindful that just because a flower may smell delightful and looks pretty, it doesn’t mean it can be eaten. So do double check with the experts we have connected to before you consume! Yes, the international recognized ‘lucky clover’ also known as Trifolium is edible. The clover is easily recognized with its trefoil leaflets. According to Good Housekeeping, the red clovers, both the leaf and the blossom can be used raw in salads, although they give a much stronger flavour after boiled. The beautiful English rose that adorns our garden (you may recall we wrote a blog about this exquisite classic in June) is also a very popular contender in the edible flower category. The petals and flowers make the most gorgeous cake decorations and can also be crystalized and used in delectable cocktails. We are in awe of these perfect pots of heaven from Drinks Stuff. Beautiful crystalized roses that can be added to a flute of champagne to create the perfect celebration cocktail. An icon of the summer months, the splendid sunflower, harvests the most delicious seeds, used as a healthy snack or as a salad garnish. According to Edible Wild Food, the sunflower, including its roots and petals can be brewed to make an enjoyable herbal tea. The delicate pansy flower, a firm favourite in our outdoor space is also a deliciously decorative addition to a green salad. The delicate flowers have a flavour similar to that of lettuce. It is also a popular aesthetic contender in cocktails, we are partial to a Black Pansy Swizzle as featured in the Cocktail Times. This timeless outdoor classic is actually grouped as an edible herb with both the flowers and leaves used in cooking whilst still fresh. Both the buds and stems can be used dried and feature in spice pantries. Fashionable dishes using this elegant herb include, lavender lemonade, lavender ice-cream and chocolate lavender fudge. This recipe for lavender lemonade, featured in the Telegraph newspaper is everything, and the perfect way to cool down during the scorching summer months. This soothing herb is most widely associated with tea and the relaxing properties it holds. Chamomile is thought to aid sleep and reduce periods of stress. But did you know, the leaves and the dainty white flowers are edible and can be used as a salad toping. It is worth noting if you are allergic to ragweed, then you should steer clear of chamomile. Reminiscent of childhood and growing seeds with mother, these orange and yellow sunshine coloured beauties, Latin name means ‘nose twist’ because of its uber strong peppery flavour, reminiscent of radishes. 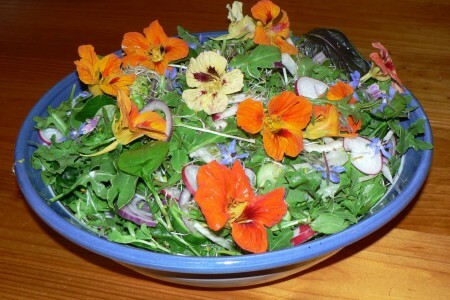 The flowers, buds and leaves are all edible and make a very tasty pesto dressing. Why not visit our glorious Celebration Garden to see some of these magnificent flowers in a natural habitat? Of course, the glorious dandelion is actually a weed (or a wild flower) so we do try hard to limit the number of these in our gorgeous garden space. Our relaxing Dahlia Coffee House has freshly made delicious picnics available for purchase and consumption in the garden. Come along and enjoy our outdoor space and beautifully carved wooden furniture, while soaking up the peace and tranquility of this mesmerizing venue. Previous Post: Old Oak Tree Lives on!